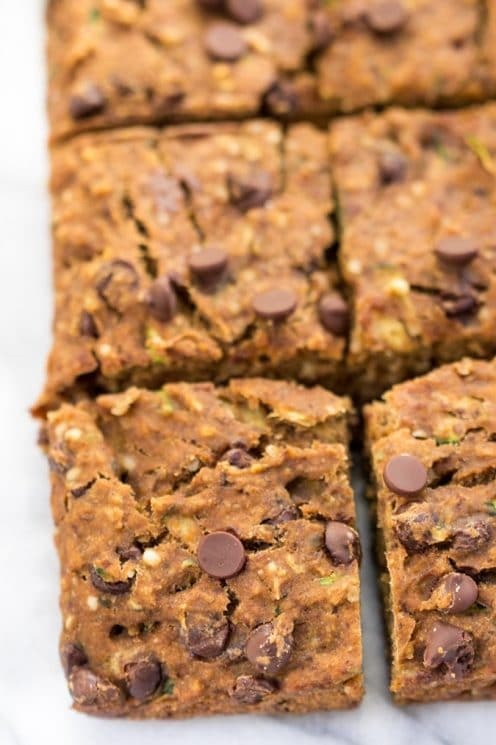 A healthy kid-friendly snack that is high in protein and doesn’t use any weird protein powders! Instead these are packed with fruits, veggies and all sorts of nutritious ingredients! To start the recipe, we’re going to make a flax egg. 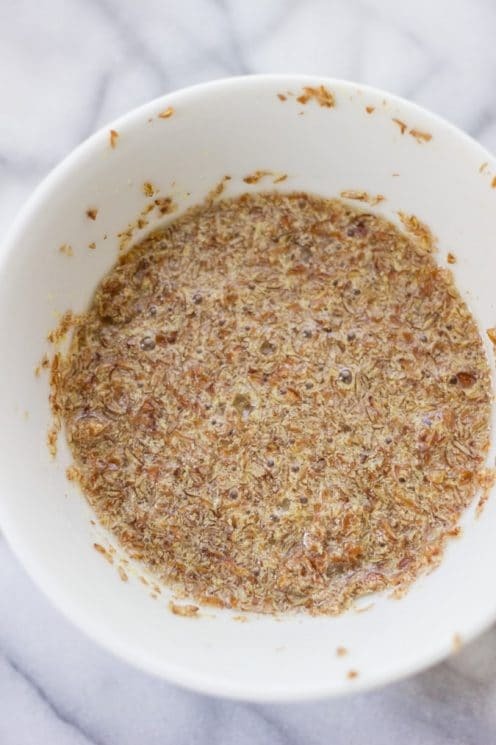 You may have seen this in other vegan baking recipes, but when you combine flaxseed meal and water together, it forms into a gel and you can use it to replace eggs in a recipe. 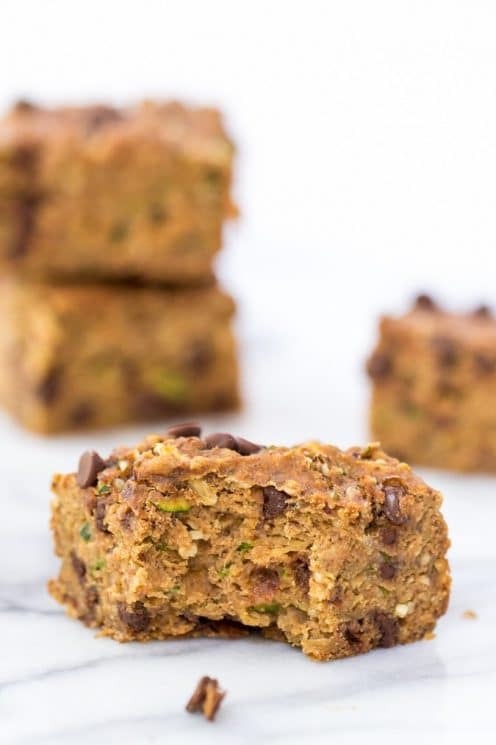 While it doesn’t work 100% of the time, I’ve used flax eggs successfully in everything from pancakes, to cookies and now these protein bars. As the flax and water is sitting, you can begin to prepare the base of these bars. I know it sounds crazy, but think of it almost like black bean brownies. 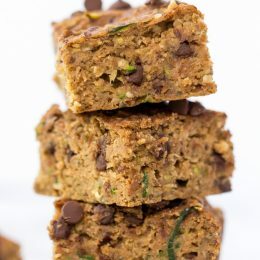 You can’t taste the beans at all and they end up helping to make the bars super moist and also high in protein and fiber! Then just mix it all together until a smooth dough forms and it’s time to stir in your add ins! Here’s where we add the veggies (in the form of shredded zucchini). We also added hemp hearts because they are so high in protein and are a great natural source of it for kids! And of course, to make these bars super kid-friendly, I chose to stir in some chocolate chips. Not totally necessary but definitely delicious! Then just bake them up in an 8×8 pan and you’re done! See how easy that was? You (and your kids) are going to love these! they’re sweet, but healthy enough for breakfast! they’re portable and great to toss into lunch boxes, eat after school or even post-baseball game! Preheat the oven to 350°F. Grease and line an 8×8 baking pan with parchment and set aside. 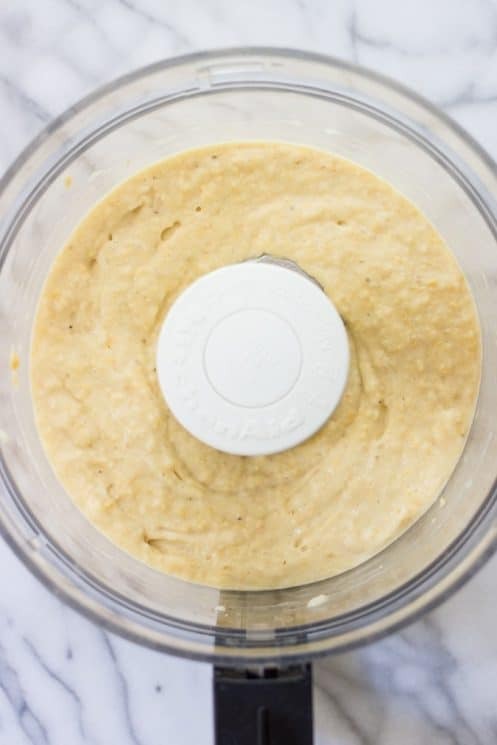 Meanwhile, drain the chickpeas and add 1 cup to a food processor along with 1 cup of mashed bananas, until completely smooth. 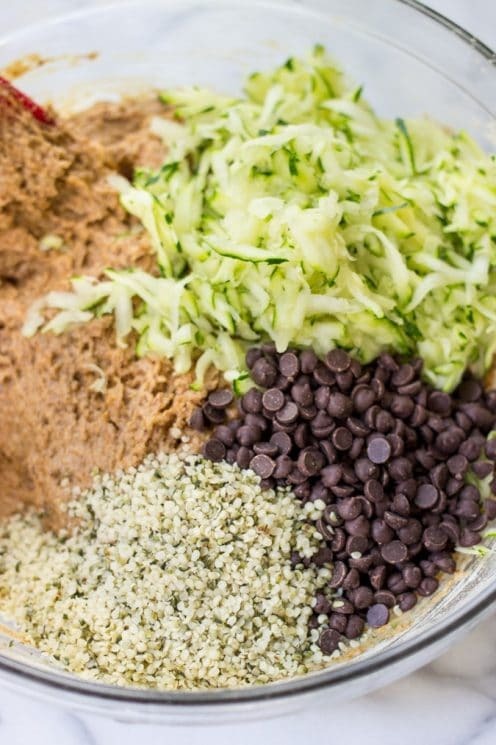 In a large mixing bowl, whisk together the dry ingredients, reserving the hemp hearts, zucchini and chocolate chips. 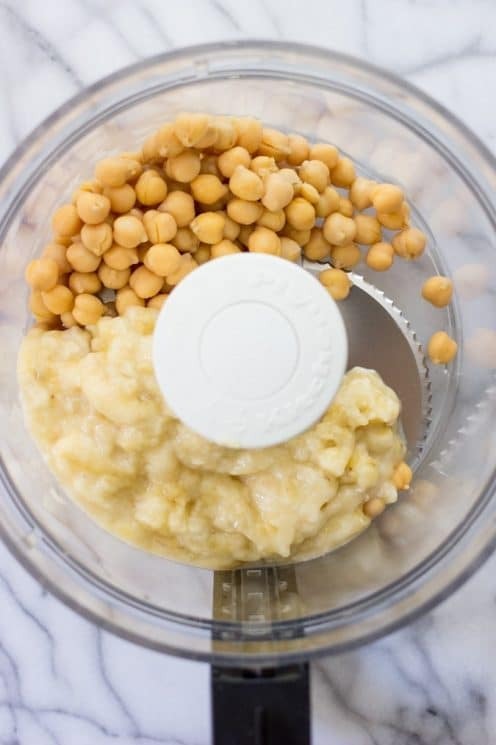 Pour the chickpea puree into the bowl along with the flax egg and mix to combine. 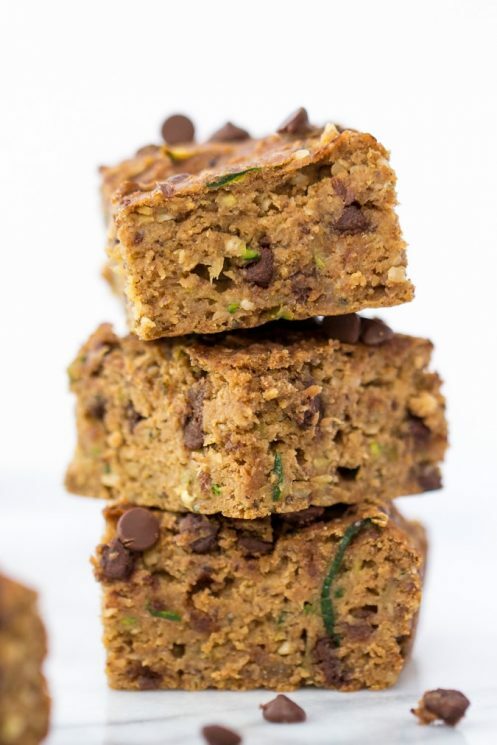 Fold in the hemp hearts, grated zucchini and chocolate chips. Dump the batter into the prepared pan. Bake on the center rack for 24-26 minutes until a toothpick inserted into the center comes out clean. Let cool in the pan for 10 – 15 minutes, then transfer to a wire rack and cool completely before slicing (this is important!). Slice into 12 – 16 bars. Store on the counter for a few hours if they seem too moist, otherwise put them in an airtight container and store them for 2 – 3 days. These look amazing! I love the ingredients– low sugar and lots of protein. These would also be great at the office for an afternoon snack. Is there another option for the banana? I am allergic. So many healthy recipes call for banana it is very frustrating trying to find other options to substitute. I always use unsweetened applesauce in place of bananas, 1/4C per banana. I haven’t tried it with this recipe but it has worked in many others. Often times applesauce or whole fat Greek yogurt can be substituted. Even avocado can be a good substitute. However, with the yogurt and avocado, you’d probably want to add a bit more sweetener as those two are not naturally sweet like applesauce or bananas. Question….if allergies are not an issue you could you substitute a regular egg and whole wheat flour? We made these and they are so delicious! We used a regular egg instead of a flax egg but other than that followed the recipe! I really loved them! We just made these and they smell awesome. Is there Nutrition Info somewhere for these? What are the macros for these please? Hi Rachel- You can enter ingredients in a database like nutritiondata.self.com and it will be calculated for you. Is it quinoa flour or all purpose gluten free? Also what could I sub for hemp hearts? I was intrigued by this recipe and while the flavour is good, I found the consistency quite mushy. It’s not stopping me from eating them though! I am not sure how to remedy this in the future? Followed the recipe exactly. They smell great. Taste is okay.. As indicated by Haley, they came out very mushy. The middle reminded me of the consistency of Pumpkin Pie. I ended up baking for about an hour. then took it out of the pan with the parchment paper and flipped it upside down in a 9 X 13 and then baked it another hour. Then let it cool completely, as suggested. It is still mushy. My grand-kids would never eat these, no matter the taste, with this consistency. They definitely will not keep their shape as bars. Can’t help but wonder if using a regular egg would fix the problem. Suggestions?? 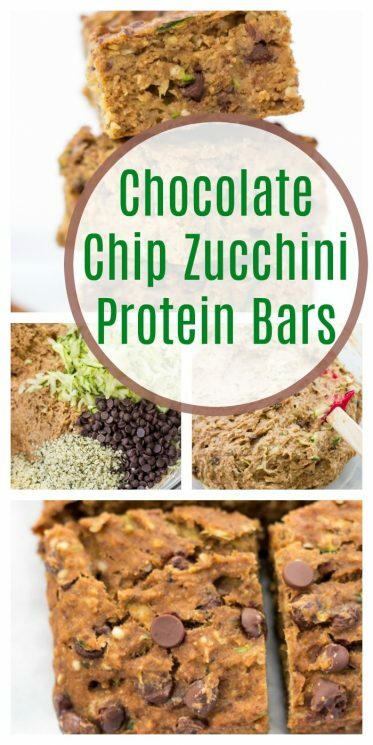 These look interesting, but if you’re calling them Protein Bars, you should really supply the nutrition information for that nutrient. If you saw something in the store labelled ‘Protein Bars,’ the grams of protein is one of the first things you’d look for. No different here. I agree with the last two commenters. The bars smell and taste great but the texture is very mushy – not a bread or cake-like consistency. They do not look the same as they do in the picture that was posted, and they took much longer to cook than the recipe suggested. I’m wondering if there is anything that can be done to firm them up in the future as I would really love to give the recipe another try. I agree with the comments above- followed recipe exactly and they are complete mush. Inedible. Very disappointing as the taste otherwise is great. 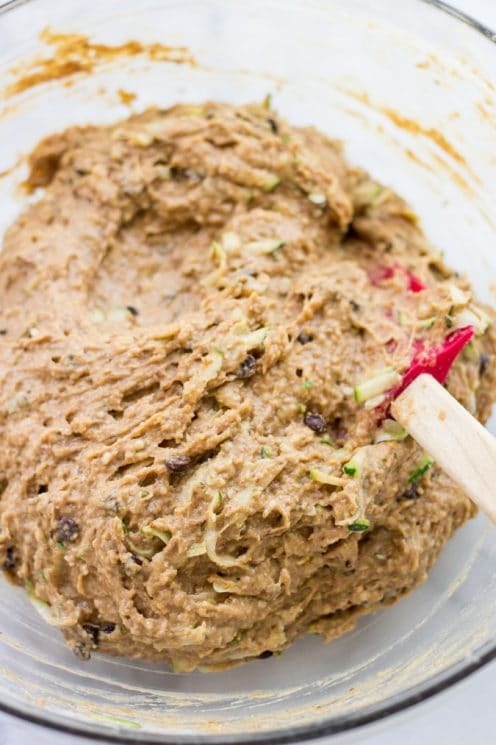 There has to be something the recipe left out…Squeezing out the water from the zucchini, maybe? I agree with above comments. Wish I had read them first- they turned out very mushy and my kids won’t eat them. Disappointed with the results. I also cooked them longer than said time. Be sure you are using canned chickpeas. In the instructions it says to add egg mixture, but in ingredients I don’t see an egg, is this the problem with this mushy recipe?? Need to add 1 egg or more?? Followed the recipe exactly, and even tried doubling the baking time, but still no good. Disappointed that I wasted time and ingredients on a bad recipe. These only contain 3-4 grams of protein per bar if you are using 12-16 servings like the recipe says. Hardly “protein bars”. I made these today and had to bake them for over an hour. They never set up. They are very mushy and soggy. The picture is a chocolate tower?? After reading the comments I still wanted to try these but decided to make them in my mini muffin pan. I put the first batch in for 20 minutes and they poped right out of the pan to cool on a rack easily. Still very moist inside but definitely edible. Made just shy of 40 muffins. I used mini milk chocolate chips to make them a tad sweeter for my kids. They taste great! Hi, I was dying to try these. I tried them using almond flour instead of quinoa flour. They smelled fabulous and I tried a tiny bit and they tasted ok but completely mushy. I don’t know what I did wrong. I left them out all night and actually tried putting them back in the oven the next day for over an hour. They were a little better but still too mushy. Any suggestions about what I could have done wrong or could do differently? How do we keep these from getting mushy? Add another half cup of the quinoa flour??? The instructions were not clear with ingredients. The bars needed at least 10 or more minutes in the oven and were very gooey.